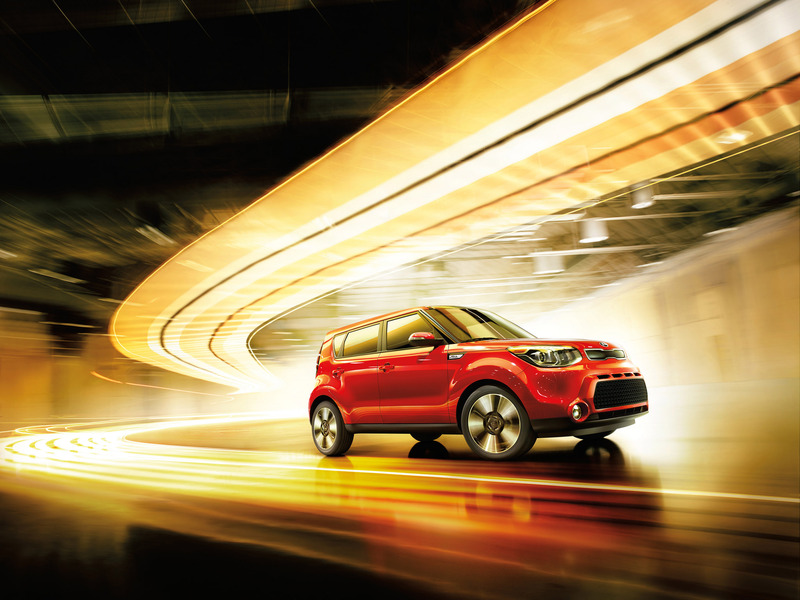 The 2016 Kia Soul has so much to offer! Everyone loves its eye-catching, boxy styling (including hamsters), and, despite its smallish proportions, every passenger will have plenty of room to spread out, with plenty of space for all their stuff. The Kia Soul is packed with technology and other great features and getting up to 31 mpg on the highway doesn’t hurt either. The 2016 Kia Soul Base operates on a fuel-efficient 1.6-liter Inline 4 engine that can achieve up to 30 mpg highway and 24 mpg city**, generating 130 horsepower and 118 lb-ft of torque. The Plus and Exclaim trim get slightly more gas mileage thanks to its 2.0L Inline 4 engine, at 31 mpg highway and 24 mpg city**. The 2016 Soul + and ! can also generate up to 164 horsepower and 151 lb-ft of torque. This zippy car can maneuver into tight spots or wind around the backgrounds with grace and ease! Test drive one to see for yourself! glass with timer, Chrome and matte black front upper grille, Variable intermittent windshield wipers, Matte black front and rear bumper inserts, Dual body-color power mirrors, Locking fuel-filler door, Rear wiper/washer, Multi-reflector headlights, 16-inch alloy wheels, and Privacy glass. On higher trim levels, you can find more impressive exterior features including: Chrome and gloss black front upper grille, Heated outside mirrors, Front fog lights, Auto light control, 17-inch alloy wheels, Gloss black front and bumper inserts, 17-inch alloy wheels, Mirror-mounted LED turn-signal indicators, and/or Body color front and rear bumper inserts. While everyone loves the look of the Kia Soul, you will especially love all of the fantastic interior features to keep you informed and connected! The 2016 Kia Soul comes standard with interior features including: Air conditioning, Height-adjustable front seat-belt anchors, Glove box with illumination, Tilt and telescopic steering column, FlexSteer™, Dual front cup holders, 60/40 split-folding rear seat, Power windows with driver one-touch auto-down, 6-way adjustable driver’s seat, Interior lighting with delay off, Dual illuminated visor vanity mirrors, Soft-touch dash and upper door panels, Rear seat adjustable headrests, Power door locks with two-turn entry system, Day/night interior rear-view mirror, Front and rear door bottle holders, and Woven and tricot cloth seat trim. The standard radio and technology features will get the party started in the 2016 Soul. The standard features include: USB/auxiliary input jack, AM/FM/MP3/SiriusXM® Audio System, Trip computer, 6 speakers with dash-mounted tweeters, Steering-wheel mounted audio controls, and Bluetooth® wireless technology hands-free connectivity with steering-wheel mounted controls. up/down and anti-pinch, Cargo cover, Woven cloth seat trim, Front-seat center console with armrest, Leatherette door center trim inserts, Leatherette meter hood, Auto-dimming rear-view mirror, Leatherette door armrest, 10-way power driver’s seat with lumbar support, Leather seat trim, Piano Black accents, Satin chrome interior door handles, and/or Leather-wrapped steering wheel with gearshift knob. On these higher trim levels, the radio and tech features step up their game too! Enjoy some of the following features: 4.3-inch color touch-screen audio display, Cruise control with steering-wheel-mounted controls, Rear-camera display, Remote Keyless Entry with folding key and illuminated ignition ring, and/or Active Eco System. Some of the standard safety features on the 2016 Kia Soul include: Full-length side curtain airbags, Vehicle Stability Management, Electronic Brake-Force Distribution, Front seat-belt pretensioners, 4-wheel disc brakes with Antilock Braking System, Electronic Stability Control, Hill Start Assist Control, Tire-Pressure Monitoring System, Dual front advanced airbags, Dual front seat-mounted airbags, 3-point seat-belts for all seating positions, Side-impact door beams, Front and rear crumple zones, Lower Anchors and Tethers for CHildren (LATCH), and Rear child-safety door locks. No matter where you want to go, the 2016 Kia Soul will take you there in style. Passengers will love the high-tech, grown-up interior and all the space they have to stretch out. If you’re looking for a car that stands out from the crowd, come take a look at the exciting 2016 Kia Soul today at Carriage Kia. With our large inventory, our team here at Carriage Kia loves helping our customers find the perfect new car or used car for them! Please feel free to contact us if you have any questions or would like to schedule a test drive! *Starting price is manufacturer’s suggested retail price (MSRP) for lowest model trim. See ‘Trims’ section for MSRP of model shown. MSRP excludes destination and handling charges, taxes, title, license, options and dealer charges. Actual prices set by dealer and may vary.